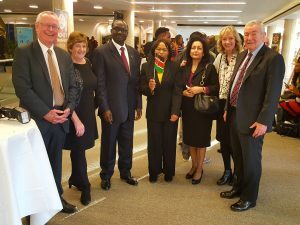 From left to right John Small, Chief Executive Eastern Africa Association, Patricia Orr, Kenya High Commissioner H.E Lazarus Amayo, Anne Kamau, Kenya High Commission Second Counsellor (Commercial), Marlene Walker, Anne Small, Patrick Orr, Kenya Society Chairman. On Tuesday 12 December the Kenya High Commission along with members of the Kenya Society celebrated the 54th Jamhuri Day Anniversary in London. The well-attended lunch was addressed by The Kenyan High Commissioner H.E. Lazarus Amayo, and the Rt. Hon. Rory Stewart OBE, Minister of State for International Development and Minister of State for Africa. Distinguished speakers included Mr Jeremy Lefroy MP, Chairman of All-Party Parliamentary Group on Kenya and Lord Chidgey, Chairman of All-Party Parliamentary Group on Africa. In his address, the High Commissioner H.E Lazarus Amayo highlighted the significance of 12 December in Kenya’s national calendar as it is the day when the country gained its independence in 1963 and become a Republic a year later on the same day in 1964. He added that the country had made tremendous progress since gaining independence and committed to continue implementing policies that will further transform Kenya. The High Commissioner thanked the Kenya Society for co-sponsoring the event and wished all guests a prosperous 2018.